Board Members & CEO - INVESTING IN ONE OF CANADA'S MOST PRECIOUS NATURAL RESOURCES, THE HUMAN-ANIMAL BOND. ​Andréanne enjoys volunteer work, in particular where it concerns raising awareness for those in need, whether for a human or animal rights organizations. She is an influential leader with the ability to connect with people of diverse backgrounds. She has an ability for learning languages, being proficient in French, English, Italian and German, and some knowledge of Latin and Arabic. In her spare time, she enjoys riding her horse and spending time with her precious dog, Rogue. She was also a reputed Korat breeder, and has since kept three of these beautiful cats. Andréanne holds a Bachelor degree in Philosophy and Social Sciences. She graduated with a Common Law Degree in 2017 with aspirations of promoting and advancing social justice. Christina is the Foundation's Director of Marketing and Communications. Her professional background within the public and private sectors along with her extensive communications design and implementation experience couldn't have been a better fit. Christina is skilled in content development and through the execution of several successful campaigns has acquired considerable knowledge of the best practice methods involved in creating and marketing content for a variety of audiences. Christina joined the Foundation with the goal of utilizing her professional expertise to benefit a cause that is very dear to her heart. Befittingly she is a devoted pet parent, avid animal lover, and strongly believes in the value of the bond between people and their pets. Giving of her time and talents is not limited to CFAS. Rather, she gives generously to other worthy charities such as the Ottawa Humane Society. This talented lady holds a Master of Arts degree with a Specialization in Organizational Communication, and a Bachelor of Arts in Communication with a Minor in Psychology from the University of Ottawa. ​Ersi is an accomplished Chartered Professional Accountant (CPA) with more than eight years professional experience in the banking and pension industry. She is passionate about utilizing her wealth of transferable skills to invest in one of Canada's most treasured relationships;the human-animal bond. Along with her professional accomplishments Ersi brings her heartfelt commitment, compassion, and much loving kindness in all she does to contribute the Foundation's success. Rubina Sultan is a mother of three young children and the owner of three elderly dogs whom she rescued. Professionally, she has worked as a Chemist, science Educator, Property Manager, and as a Store Manager for an outreach mission. She also devotes considerable time volunteering at her children’s' school and operating community based programs such as homework clubs. Up until five years ago, she was the co-owner of a not-for-profit Labrador and golden retriever dog rescue organization called Save-A-Lab. Rubina and her husband rescued over 50 labs and Golden’s over the years and successfully placed them in good, stable, and loving homes. Many of the dogs they rescued had been abused and required considerable rehabilitation. Rubina came on board with the Foundation because it allows her to combine her love of animals with her desire to make a difference in the lives of others. ​Joanne is a community advocate at heart; a hard working professional in the disability sector for over 25 years. Her work in the public, private, and non-profit sectors encompass expertise in the areas of Pastoral Care, Support Group Facilitation, Early Childhood Education, Animal-Assisted Therapy/Activities, Humane Education, office/public administration, website development, and all aspects of voluntary sector management. Other areas of focus have included working with people who are homeless, or unstably housed, and victims of crime. Her passion is fueled by her desire to work collaboratively so as to sustain healthy relationships, safe communities, and thriving organizations. Joanne's personal mission in life is to express her faith and hope, through loving kindness. Her definition for 'innovation' is that it's a result of fearing less and loving more. 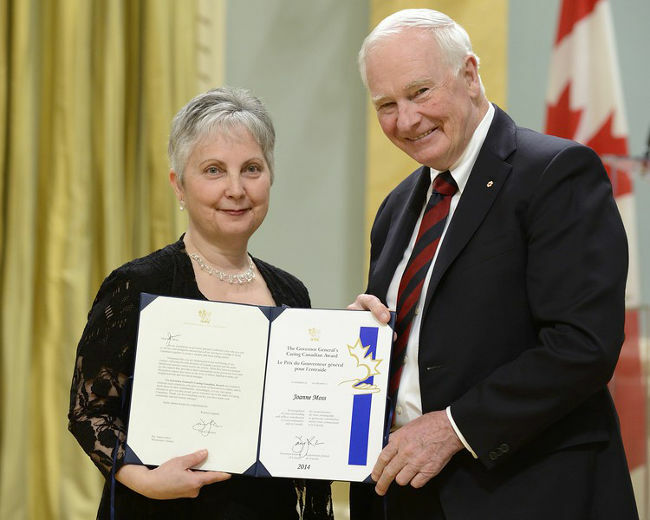 ​Photo Credit: Winchester resident Joanne Moss, left, receives the Caring Canadian Award from Gov-Gen. David Johnston on Tuesday April 14, 2015 in Ottawa. MCpl Vincent Carbonneau/Submitted.